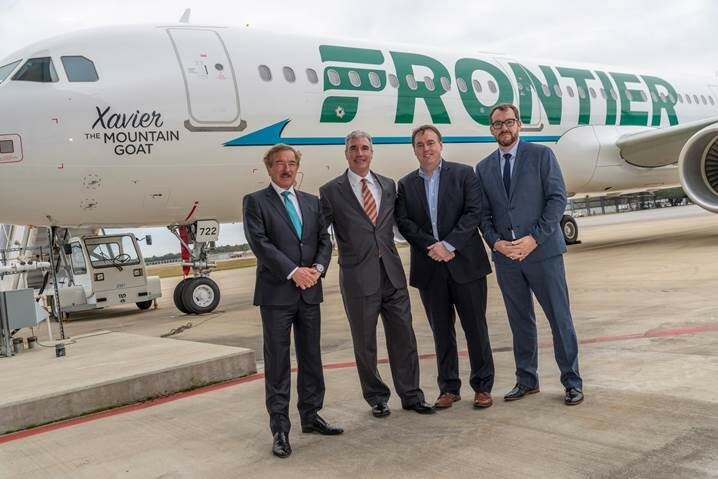 A milestone delivery was celebrated in Mobile, Alabama, today by Steven F. Udvar-Házy, Executive Chairman of Air Lease Corporation (ALC), joined by Frontier Airlines CFO Jimmy Dempsey and Airbus Americas Chairman & CEO Jeff Knittel. ALC took delivery of its first U.S.-produced A321 aircraft, delivered from the Airbus U.S. Manufacturing Facility in Mobile. It will be leased to Denver-based Frontier Airlines and features Xavier the Mountain Goat on its vertical tail and Sharklets. The aircraft is the first U.S.-made A321ceo to enter Frontier’s fleet; the airline had previously taken direct delivery of six A320neos from Airbus’s Mobile production facility.